As approved designers, suppliers and installers of Twistfix and Thor Helical products, Newman Building Solutions are structural repair specialists with the technical and practical skills and experience to provide a complete design, specification and structural repair service. 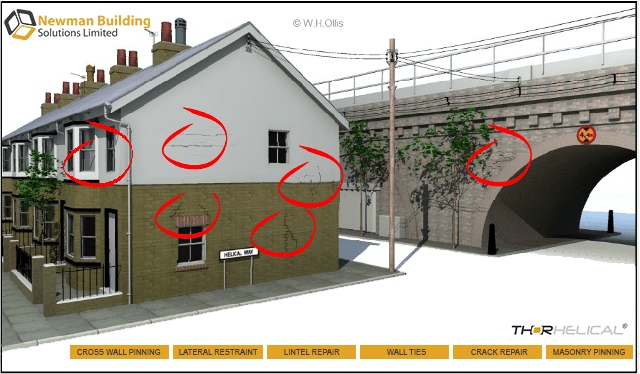 We offer many services such as Bed Joint Reinforcement (crack repair), Wall Tie Replacement, Lateral Restraint, Lintel Repair as well as other building stabilisation and structural repair services. Newman Building Solutions also offer other specialised repair services to the remedial industry. Concrete Repair and Sealants, Masonry Facade Maintenance, Brick Cleaning, Brick Tinting, brick and stone restoration and Emergency Repairs specialising in damp, flood, fire and impact damage. We are approved, registered contractors for leading manufacturers and suppliers to the building and structural repairs industry including Steadfast, Twistfix, ThorHelical Remidial, Sika, Vulkem and Flexcrete. As a member of Construction Guarantee Services (CGS), all of our structural repairs can be covered by an optional, CGS 10 Year Guarantee Protection Insurance, offering our clients complete peace of mind.